LAURA is a popular college student who lives her college life to the fullest and gladly shares it with her 800 Facebook friends. But when she accepts a friend request from her mysterious classmate MARINA, she unwillingly sets a terrible curse in motion. The dead girl’s impenetrable profile begins to drive Laura into isolation. It takes control of Laura’s virtual world and her real life as well. One after another, her closest friends die horrendous deaths. Leaving Laura with only a few days to solve the enigma of this haunting curse to save the few friends she has left, as well as her own life. 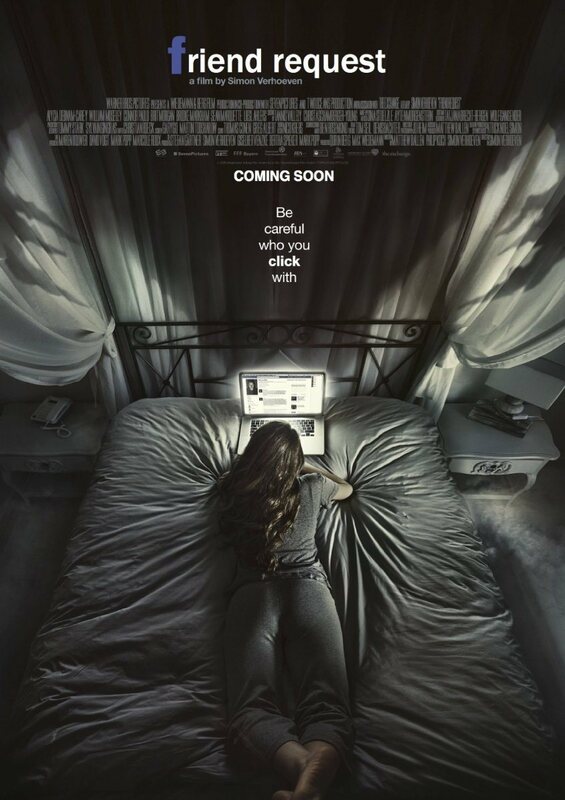 I decided to catch this film as it’s the second horror film in the week about social media (first being Grace Thai Movie), and I thought it might have the same concept as Unfriended movie. I was right and wrong. This film revolved around Facebook (or should I say an imitation of Facebook) while Unfriended used Youtube, Facebook and Skype. So being a social media addict, this film naturally attracted me and I thought it would be interesting to see how “being addicted to social media” could harm me. I was pretty disappointed by how the film turned out. While the actors did a great job, this film lack a solid backstory. Unlike Unfriended where the “victims” were all contributors to the girl’s death, here, there was no real reason why Laura Woodson was targetted by Marina (the creepy girl) except that she was unlucky or kind enough to accept her as a friend on Facebook. But seriously? They are from the same class, was the film trying to teach the audience never to accept any friend request, even if the request come from someone you’ve met in class? Or is it, judge a book by its cover, if the girl looks weird, DO NOT be her friend! With clichéd horror scenes that makes viewers think, why do you even go there when there’s noise and weird things going on, the film seem to a copy-paste plot from Unfriended. People die one after another, this time you watched in in life instead of watching it through Skype. The only ingenious part comes only at the search for the suicide location of Marina, as well as the idea of black magic. While the hidden suicide location was truly difficult and impossible to locate, I was horrified (and impressed) by the final few plot twists and scares. Don’t worry Facebook, I’m still not gonna quit ya! Originally titled Unknown Error, the film was later renamed to Friend Request internationally, to avoid confusion with the 2014 film Unfriended. However in Germany, the film is titled Unfriend, since Unfriended was released as Unknown User in Germany. This film also serves as a German version of the 2014 American horror film -Unfriended. The film was shot in Cape Town, South Africa. Though the film was produced by German director Simon Verhoeven and German production companies, the largely English-speaking cast required the film to be shot in English. Check out Friend Request Official Website and Facebook Page! Friend Request is out in cinemas on 28 April 2016. Sorry to hear it lacked backstory. I can see how these kind of storylines are going to be prevalent now though, social media is everywhere. I really hope they had a much deeper story line other than Laura just being unlucky. Or is it the fact that she’s popular and Marina isn’t? These horror flicks are really just made to scare you, but it’s really annoying if it doesn’t run deep. Movie seems ok and very much related to today’s scenario of social media and addiction but not so much keen to watch it. Movie directors are getting less and less creative. It’s sad. I could tell you how this entire movie goes just by looking at the title. Great review. OMG! Am reading this post in the middle of the night and feeling so scared. I would skip since horror movie. It’s nice to see movies taking advantage of the social media craze. It would be nice to see the horror aspect of this one too. I’ve seen the trailers and I just wasn’t interested. Now that you’ve reviewed it here, I won’t even bother seeing it unless it’s on Netflix and I can stream it. This movie is very relevant in today’s age where most millennials communicate through social media and are addicted to it. We watched this movie and thought it was okay.